It may seem contradictory to release a translation of a work which questions ideas of “the new” some twenty-two years after the German original. 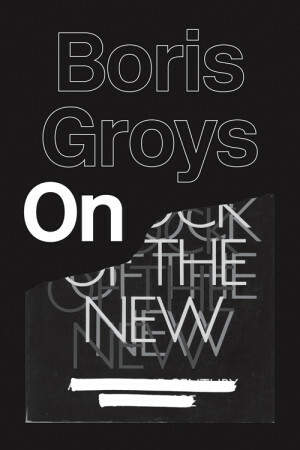 Yet the belated English publication of Boris Groys’s On The New (2014), demonstrates the text’s endurance according to the very means encouraged by Groys himself: by crossing the threshold into “valorized” culture. A German philosopher and critic of Russian descent, Groys’s many writings have recently enjoyed a renaissance in the English-speaking academy. This latest edition responds to the circumstances of artistic production in the heyday of postmodernism and its critique, complementing contemporaneous English-language works like Andreas Huyssen’s After the Great Divide: Modernism, Mass Culture, Postmodernism (1987), and Fredric Jameson’s Postmodernism; Or, the Cultural Logic of Late Capitalism (1992). Groys’s text also offers a valuable perspective on more recent attempts at grappling with the cultural legacy of the historical avant-garde in titles such as Alain Badiou’s The Century (2007), or Jacques Rancière’s The Politics of Aesthetics (2006). Moreover, On the New is useful for readers seeking to situate Groys’s own recognized attempts at offering precise definitions of the relationship between (Western) postmodernism and (Eastern) post-communism, as he has done in another recently translated work, The Total Art of Stalinism: Avant-Garde, Aesthetic Dictatorship, and Beyond (2011). Encompassing greater breadth than his other works, On The New is Groys’s dedicated effort at reconstructing the architectonics of invention under particularly difficult circumstances. It foregrounds the complexity of producing artistic work that is capable of absorbing cultural value as a laudatory object belonging to the cultural archive. Groys’s description of the exchange between production and value is especially useful if we consider that hyper-mediated cultural environments of global scale were largely disdained by critics of postmodernism for having made creativity an all but impossible criterion of art. Notable, however, is the way in which Groys’s own critique refuses the symptomatic readings that dominated the field of cultural theory at the time of the book’s original publication. By emphatically refusing to diagnose the conditions of postmodernity through such readings, Groys more effectively challenges the primacy of alterity and the aesthetics of disenchantment that have since come to stand as postmodernism’s most elementary and significant outcomes. In other words, Groys is successful here in cementing his variance with the epistemic claims of postmodernism, but without in turn rejecting their reality or impact. By provoking his readers to reconsider the capacities of innovation, Groys challenges us to acknowledge how the course of innovation determines value, and to further assess the resistance or transformation of such value under the pressure of the new. Groys’s book is divided into three unequally distributed sections. The first section outlines a history of the new, and begins with a series of chapter headings that reveal the author’s suspicion as to numerously false attributions of newness—whether by “the new’s” association with alterity, utopia, difference, or freedom. In seeking to determine what the new is not, Groys manages effectively to destabilize a familiar allegory of discovery that has long been used to solidify beliefs surrounding modernity and its origins. Integral to this allegory is the assumption that prior to the onset of modernity, the new was completely undesirable, “condemned” (22), as it were, because of its presumed fraternity with degraded, profane, worldly, or secular time, and its allegiance to forces that obfuscate and contort established traditions that both define and preserve human communities—though, it should be noted that Groys speaks only of traditions from Europe. Nevertheless, while the shift to modernity is allegorized as a violent elimination of these established traditions, Groys’s historical re-narration reveals how they were paradoxically retained and repositioned in the guise of a future anterior. With the onset of modernity, Groys’s claim is that newness itself was re-valued as being “anterior to all historical time” (24), just as the mythical past had been regarded in antiquity. The value moderns placed on futurity and its association with the new thus returned, unsurprisingly, for Groys, to valorizing primitiveness, and from this vantage point, the new could then be established with reference to an “extra-cultural reality” that sits above and beyond the archive of culturally valorized objects (132). This extra-cultural reality is nothing less than a sublime alterity, an otherness the likes of which cannot be imagined except under particular and unyielding circumstances. Personified by figures of the historical avant-garde, this identification of the new with a perpetually hidden reality became the unattainable marker of cultural production. An important difference for postmodernism, however, is that the value previously accorded the new had all but lost its capacity to arouse a sense of collective optimism. Groys, writing in the heyday of this period, is thus keenly focused upon challenging the fatalistic association of the new with epistemic change. If there is any real change to speak of at this juncture, Groys reasoned, it is precisely in the growing number of melancholic responses to the impossibility for the new to be revealed at all. Indeed, Groys’s argument is distinctive for the way it refuses to entertain the tendency among contemporary cultural critics to regard innovation with a sense of disenchantment, rejecting in turn the belief that innovation can cajole the real or the true out of hiding. More specifically, by dispelling the notion that all innovative works must be measured by degrees of authenticity, Groys manages to remove himself from our disenchanted inability to imagine the present as an age that can potentially catalyze the new. Accordingly, Groys exclaims that “the new is not just the other, it is the valuable other” (48). To put it another way, Groys maintains that a different sense of value can be encouraged, both beyond and in contravention to the measure of authenticity that otherwise serves as an anchor for objects of value. In the second part of the book, entitled Strategies of Innovation, Groys discusses specific works that are capable of retaining their value as new. Such retention is a process, he writes, in which “valorized” culture is transformed by its structured relationship to the realm of the “profane.” For Groys the profane realm offers up a “reservoir” (64) of materials for the artist—a mix of objects and ideas that may be considered dangerous, transitory, banal, or simply other. As the artist combines this material with established items from the cultural archive, there is an immutable but productive tension in the object, and this for Groys is what ultimately constitutes innovation. Established culture is profaned in the same moment that the profaned object is transformed into something of value. Importantly, however, the aesthetic practice of transformation that Groys describes is not tinged with the kind of heroism that may be detectable in the historical avant-garde’s process of valuing objects. According to their artistic practice, Groys maintains, the profaned object takes the role of a mediator between the unconscious of the artist’s creative act and the sphere of universal value. The valorization at issue for Groys, on the other hand, is the kind that enjoys an exclusive relationship with the cultural archive against that with extra-cultural reality. What replaces this reality is a type of exchange that follows a logic that is similar to fashion. In its capacity as inauthentic, for example, the valorized profane of fashion refuses claims to universal value, and yet it still demonstrates the ability to locate tensions in a specific object. The most extreme tension will appear as an impossible distinction between the two realms in a single object or “work,” which is subsequently made to be valuable by the critic. To communicate this tension, Groys’s argument relies heavily on the narrative of a broad transition within Western modern art towards the aesthetics of “ready-mades,” which clearly demonstrate their capacity to represent “both value levels” (87). Groys provides several examples of ready-mades throughout the book. For instance, he reads reproductions of Mona Lisa to signify neither a total overcoming of values (as professed by the historical avant-gardes) nor their complete devalorization (as lamented by the postmoderns). Rather, the relationship between the “original” Mona Lisa and its “trashy” (66) reproductions result in making a unique work of art that is eventually deemed worthy of cultural preservation. Efforts at revaluation here are similar to those performed by Kazimir Malevich’s Black Square, a favourite of Groys’s in part because it draws attention to the value hierarchy between high art and mass culture in a way that refuses to validate any belief that the artist enjoys secret perceptions of the object. Marcel Duchamp’s Fountain brings this tendency to its fullest expression by revealing that the artist chose his object on account of it being “strategically necessary” (102) for contemporary culture at the time. For Groys, Duchamp turned the urinal upside down and emblazoned it with an erroneous signature as a way of profaning a culturally validated belief in artistic freedom. As such, Groys argues that Duchamp’s juxtaposition does not signal the “end of art” (91) as so many critics have insisted, but that it rather reveals an exchange between the profane realm and the cultural archive. On this basis, Groys suggests that Duchamp’s contribution potently demonstrates the work of negative adaptation—a process of making that does not convey art’s truth so much as it signals truth’s suspension by the profane. Readers of Groys in English may be grateful for his effort to salvage the constituents of innovation in a time of saturated global capital, and yet for the same reasons, his overall position on the state of contemporary art might appear to be limited or simply dated. For Groys, “innovation is carried out mainly in the cultural-economic form of exchange” (139). In the third part of the book entitled Innovative Exchange, Groys once again tries to bypass postmodernism’s obsession with imagining the profane realm through a figure of scarcity. The logic of the obsession according to Groys is grounded in the presumption of cultural activity that works to simulate the profane in order to accelerate the process of exchange, with the imminent threat of erasing the profane entirely and replacing it with a cultural archive that is driven to tyranny. Groys unsurprisingly rejects this “ecological counter-argument” (110) on account of its belief in a universal profane that is rendered scarce and therefore inaccessible by the cultural conditions of global capitalism. Groys is rather dedicated to situating the profane historically as the placeholder of innovation, thus encouraging solutions to the contradictory means by which art’s value is determined in the present. For instance, if we accept that the profane has truly evaporated with the massification of culture, it stands to reason that we should also dispense with the archaic notions of authorship that are endemic to transforming such material into something valuable. In fact, this particular insight may be Groys’s most important contribution in the book: that of pointing to the reinforcement of conventional views upon authorship, and to the hallucination of scarcity on which those views are perpetuated and reinforced. In other words, Groys deftly indicates an ongoing crisis whereby artists are driven to paranoia over ensuring their cultural worth on the basis of the originality and authenticity of their contributions. He writes, “no one now wants to entrust his [sic] originality to the future or to let others trespass on the cultural domain” (43). Given these circumstances, Groys encourages a productive understanding of the relationship between contemporary art and market capitalism by rejecting any residual attachments to authorship as a category of innovation. He writes, “it is precisely work with existing texts and images which makes it possible expressly to demonstrate the intra-cultural originality of one’s own work” (44). Badiou, Alain. The Century. Trans. Alberto Toscano. Cambridge: Polity, 2007. Groys, Boris. On The New. Trans. G. M. Goshgarian. London: Verso, 2014. Groys, Boris. The Total Art of Stalinism: Avant-Garde, Aesthetic Dictatorship, and Beyond. Trans. Charles Rougle. London: Verso, 2011. Huyssen, Andreas. After the Great Divide Modernism, Mass Culture, Postmodernism. Bloomington: Indiana University Press, 1987. Jameson, Fredric. Postmodernism; Or, the Cultural Logic of Late Capitalism. Durham: Duke University Press, 1992. Rancière, Jacques. The Politics of Aesthetics. Trans. Gabriel Rockhill. New York: Continuum, 2008. Joshua Synenko completed his PhD from the Graduate Program in Humanities at York University, Toronto, with a dissertation entitled After Collective Memory: Postnational Europe and Socially Engaged Art. Joshua studies broadly in European social thought, visual culture, memory studies, and urban aesthetics.